PHILLIP ISLAND - Valentino Rossi (Movistar Yamaha) feels the potential to giving more fierce competition to Marc Marquez on Phillip Island, if were not for Andrea Iannone's insane stunt. The Australian MotoGP race on Sunday (10/22/2017) that was exciting. The Circuit characteristics contribute to make overtaking between all the riders. 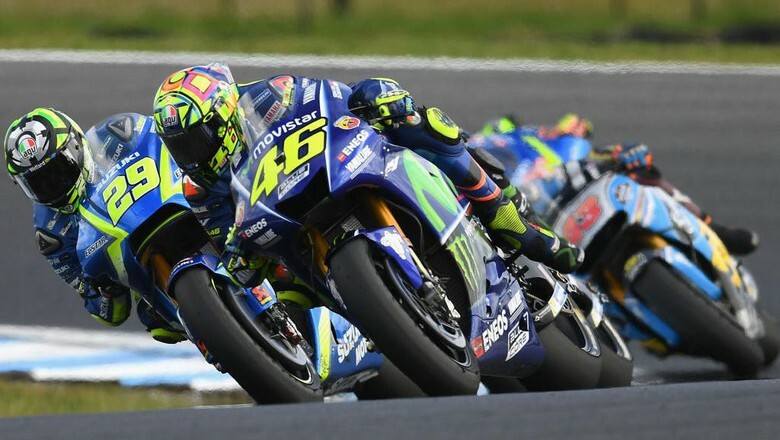 The front-riders in the race even involved around eight riders, between Valentino Rossi, Maverick Vinales, Johann Zarco and also Marc Marquez taking turns and showing off the maneuvers. On the lap 21st, Marquez passes through Vinales and then continues to keep his distance by utilizing Iannone's maneuvers to Zarco and Rossi. Rossi said that the Iannone’s maneuver which makes him loss of opportunity to overtake Marquez position at Phillip Island. I think that actually I am very potential to overtake Marquez position at Phillip Island until the end of race because my bike was speeding up, said Rossi. But when I thought was in the perfect position, Iannone suddenly arrived in the hairpin like a crazy man, and Marquez has speded away. But anyway, I think winning is not easy, he said. Rossi also commented about the aggressiveness of the other riders on the race, which resulted the incidents of nudge between the riders. Johann Zarco for example, who nudged Marquez's rear tire on the opening laps. After that Marquez also has to nudged Rossi’s bike on the race. The level of aggressiveness and nudges between the riders have been greatly improved, especially after the entry of young riders from Moto2. Zarco was always very aggressive. If you as a rider will certainly feel annoyed, but that didn’t change anything, said Rossi. This is the game if you want to play. A little more dangerous, but it should be like this if you don’t want to stay at home. Duel with Zarco, and then came Iannone, the two worst riders to be the opponent. So this is a great race that I really enjoy. Image property of Quinn Rooney/Getty Images. Why The Japanese Girls Are Slim? For the Third Time, The Court Rejected Trump's "Travel Ban"